Today, the Content Marketing Institute, MarketingProfs and Brightcove released findings from a national survey of more than 1,400 marketing professionals that reveals the shifting investments for B2B brands in 2012 and likely budget priorities for 2013. The research shows that content marketing is becoming a core part of the B2B marketing process and that these organizations are spending more, using more tactics, and distributing their content on more social networks than they have in years past. And while in years past B2B marketers were focused on producing engaging content, this year they are most challenged with producing enough content. The report also found that the fastest growing content marketing tactics include video, mobile content and research reports. On average, B2B marketers are spending 33% of their marketing budgets on content marketing, which is up from 26% last year. And 54% plan on increasing content marketing spending in 2013. On average, B2B marketers are using an average of 5 social distribution channels, the most popular being LinkedIn (compared to Twitter in the last 2 years). 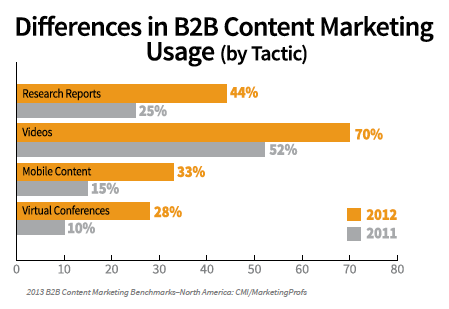 B2B marketers use an average of 12 content marketing tactics, with social media being the most popular. The number of B2B marketers creating content in-house has risen by 18%. The report proves that both the B2B customer buying cycle and sales funnel is changing. Consumers actively seek out content about products and services through social channels and increasingly on mobile devices. We are particularly excited to see that video has emerged as a compelling content type and storytelling medium that is being prioritized by marketers. Video continues to become a more central component in the marketing mix and a basic expectation of B2B buyers. To learn more about content marketing benchmarks and priorities for 2013, you can download the full report here or view it below via Slideshare. We will also be hosting a special webinar with the Content Marketing Institute to explore the data in more detail in early December, so stay tuned for that.